I decided to take a bit of a holiday this year. Of course I wasn't going to stop quilting, that's not fun, but I did do unpaid work and I've tried to stay off the computer. I'm not sure why work I don't bill isn't work but that's how my head sees it so it works for me. 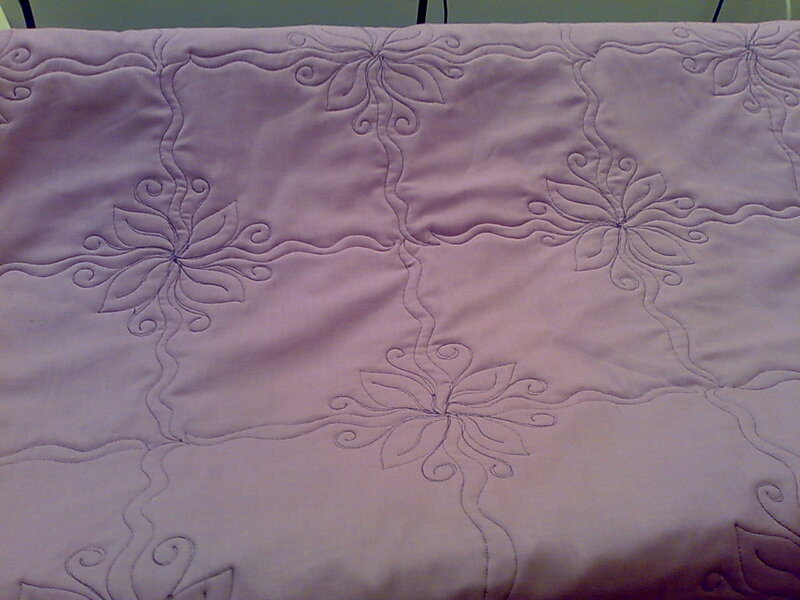 The quilt is a sample for a new pattern. The top was made for me a while ago and has been waiting for me to have time to quilt it. I have now accepted I will never have time so must just fit things in as I can. 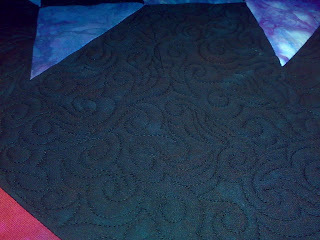 I won't post the whole quilt until the patter is printed but these pictures give you an idea of the quilting. 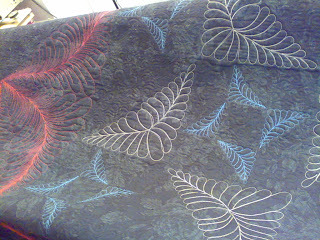 I felt it took a surprisingly long time but I guess it is quite densely quilted. For the first time I decided to count how many bobbins of thread I used. 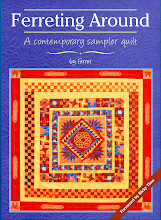 I wondered after reading another quilters updates. She recently uced over 70 on a quilt a little bigger than this one. That sounded like a lot to me, but I had no real idea how many. 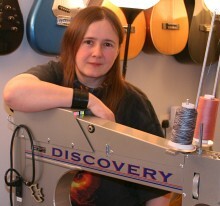 Well I used 19 bobbins, prewound masterpiece. Bear in mind I think this quilt has quite a lot of quilting. The one the other quilter did may have had 1.5 times the area of mine but even so she has done twice as much quilting! That really is a lot. Well I know a lot of people don't like this weather but I love it. Especially [as we had to go shopping today. I was not looking forward to the crowds. 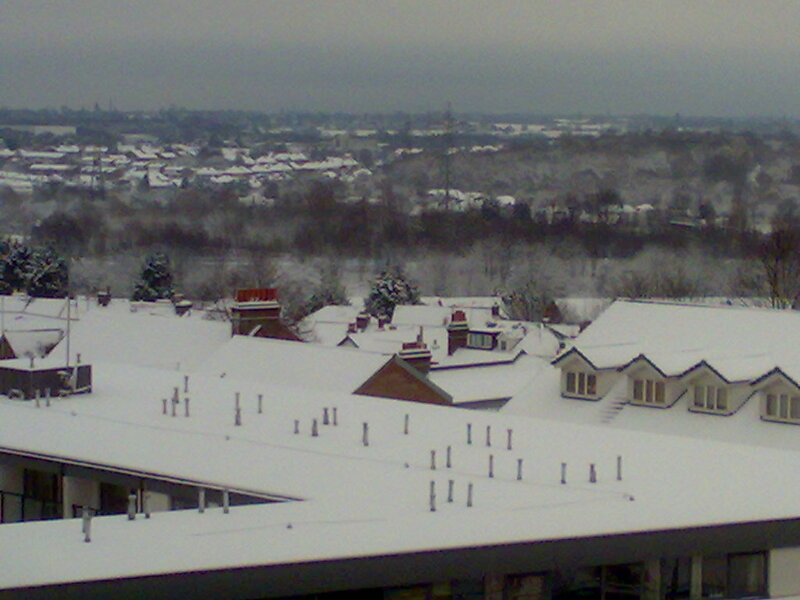 The snow solved my problem, Watford has been busy, but more like a summer weekday than a Chrismas weekend. A massive improvement. All the present shopping is now done and we are slowly making our way home. 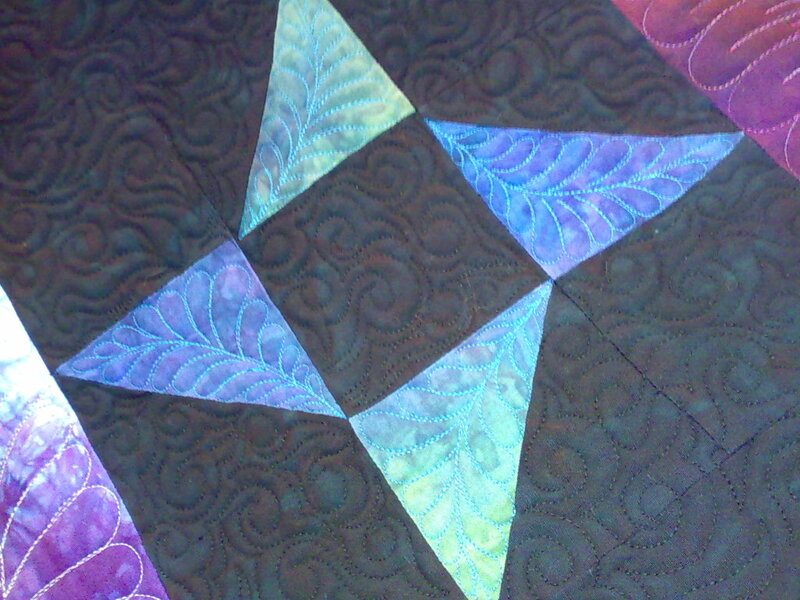 I've been quiet the last week as I've been quilting as much as possible. I've got 9 done despite my machine having a strop. There was a bright side to even that. i got chatting to a new friend who turned out to be an APQS service engineer, and a very nice lady. I still have a lot of quilts to do but I can move in the house now. 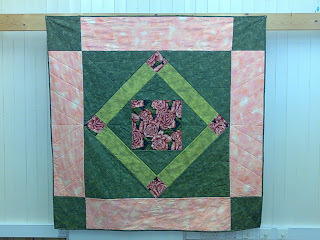 The quilt in the picture belongs to one of my students. I like her quilts as they as well behaved, but this one had quite challenging instructions. There were areas I had to avoid. 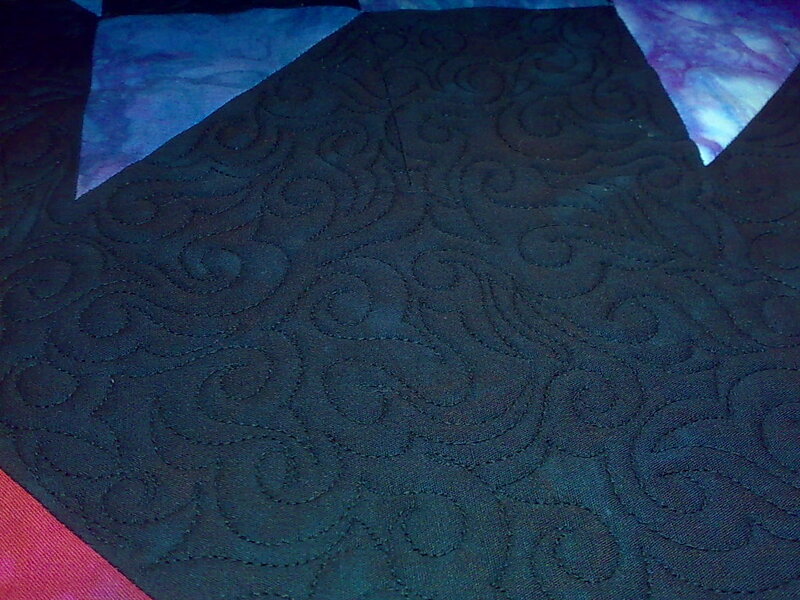 That left me with some very odd shapes to quilt. The back shows quite clearly what I came up with. We were both pleased with the result. And cheap DVD are what keep me going. 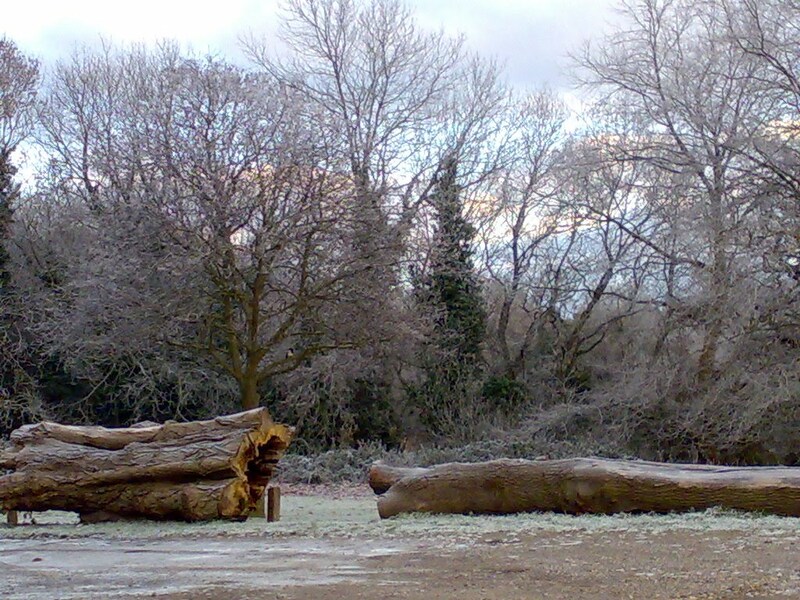 The tree isn't snowy, it's just a very heavy frost. 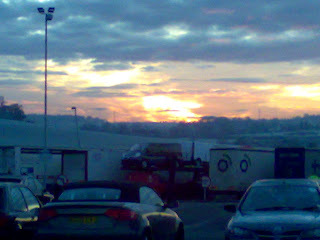 I toook the picture about 3pm. 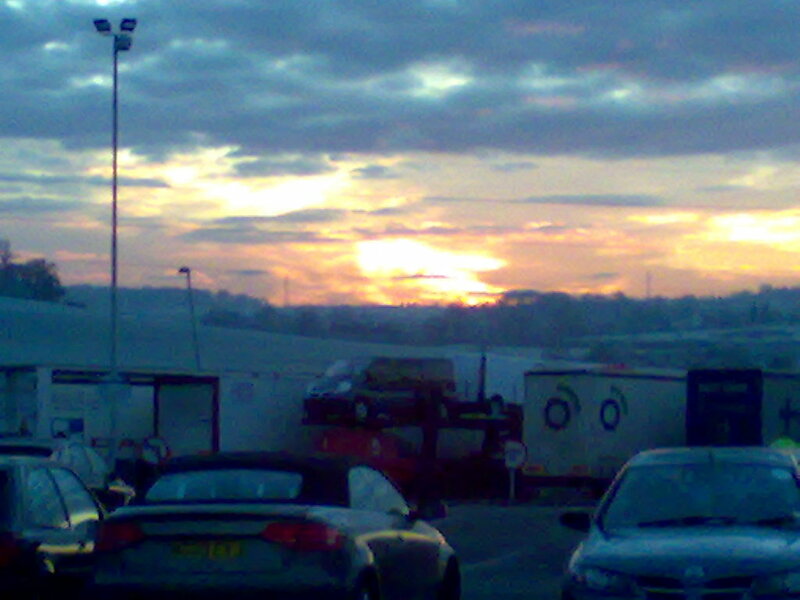 The sunset I saw at Toddington services. I think it was a bit too cold for my phone but hopefully you get the idea. It really was very pretty. Now I am sitting in a car park waiting for the quilters to arrive. I made decent time despite accidents and heavy traffic. Fortunately I didn't bring the van as the car park has a height restriction on it. It does mean there isn't much I can do except blog and watch a movie. This was my Thursday afternoon project. Lots of cutting. 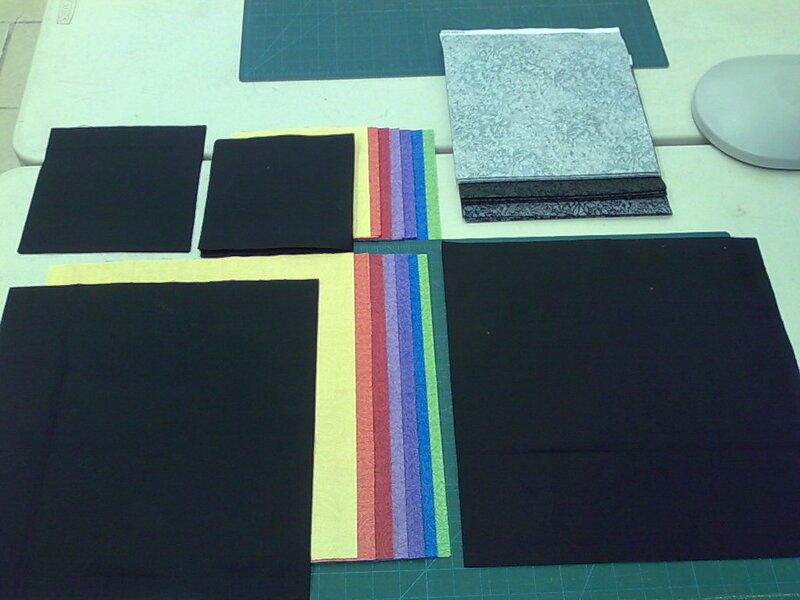 Hopefully this week I will get a fair amount of it sewn. It is my second sample of speed 5. It is rare for me to have them ready this early in the year but this one has really grabbed me. I can see so many possibilities for it. I have been working steadily on customer quilts and finally decided that if I am going to be getting this much work I have to have more storage space (20 quilts take up a lot of space) so today I rented a bigger storage unit. To give the business more room we are going to evict more furniture. Sofas take up a lot of room but don't add much so they have to leave. Saturday I had a great class. 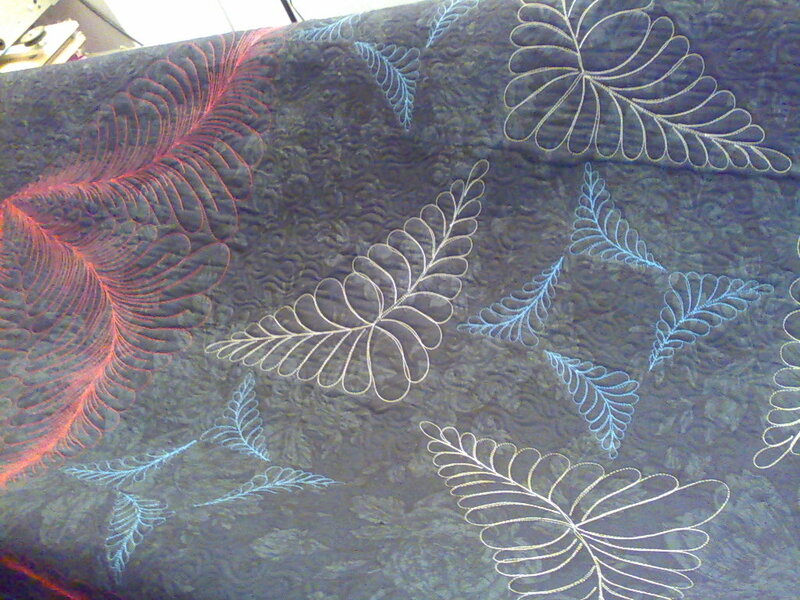 I was teaching machine quilting, which I love so it's likely to be a good day. I got really lucky this time and got a whole class of students who really took to it and allowed me to cover far more than I usually get through. 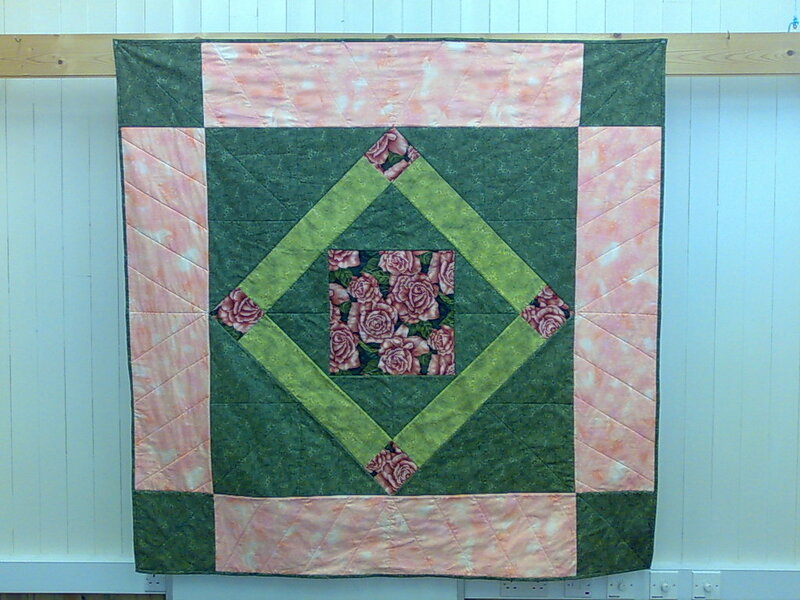 I'm still grinning and I hope the students are too as it will mean they are more relaxed and will quilt better. Keep in touch ladies, I want to see where you got from here. 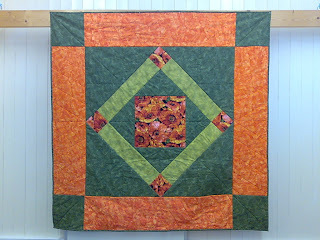 Last things first one of my students from last weeks speed quilt class brought her finished quilt in today. The pictures show the front and the back or the quilt. It's come out well hasn't it? The other picture shows the shelves in my storage room. 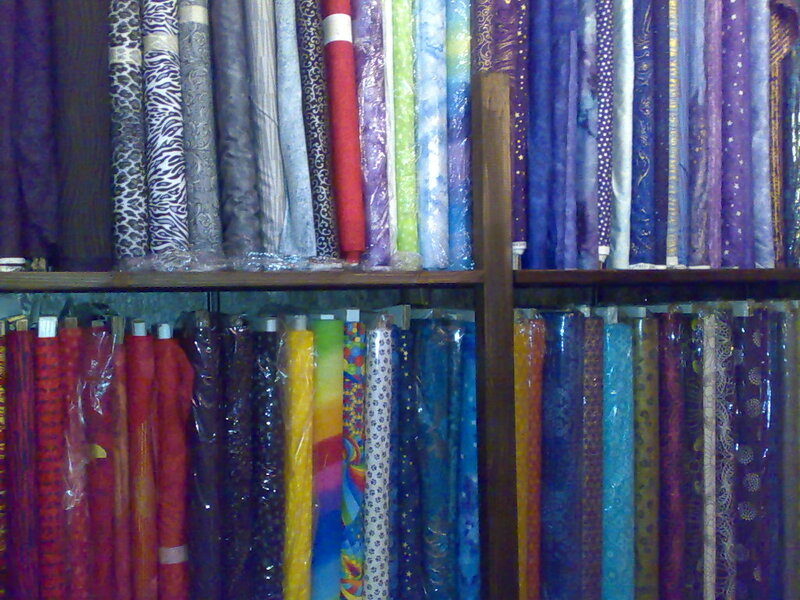 I went fabric shopping at the weekend and to make space for the new fabric I had to tidy up. I have had to evict some of my wadding to the storage unit but now I can get to my fabric. 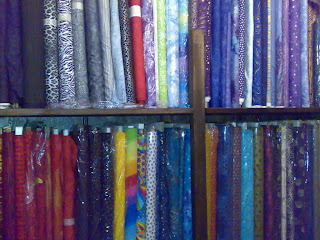 I love the way shelves full of fabric look. Monday the weather held off enough for me to get to my next frame quilting lesson. 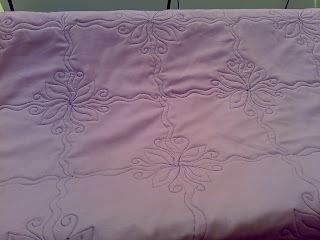 Two more ladies have discovered the joy of freehand quilting. 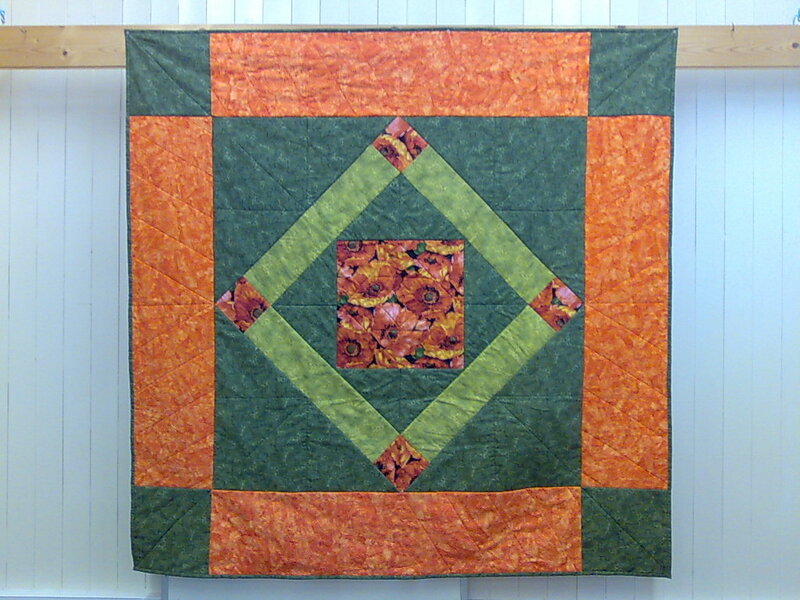 I love spreading the fun of quilting.